A child you care about is grieving the loss of someone loved. You too loved the person who passed away. Now you are faced with the difficult task of helping yourself and the child heal. Throughout the coming months you will be both a role model and care giver. 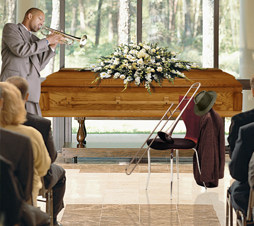 Attending the funeral will help you and your child grieve properly. A funeral can be confusing and scary to children; they should be gently guided through this experience. You and your family have chosen cremation for your loved one. You should explain what cremation is. Explain the funeral and cremation carefully at this unique child's developmentally-appropriate level. This article was created to help you be compassionate and direct as you talk about cremation. Children are naturally curious about everything, including death. To many families death is a taboo subject. A parent or family member who would gladly help a child with his science homework may be uncomfortable answering the same child's questions about death, cremation and funerals. You can be the person the child can turn to with questions comfortably. Encourage the child to ask anything about death, cremation and funerals. Always give honest answers in words that will be understood. Keep in mind to follow the child's lead. If you listen and pay attention to certain behaviors, the child will teach you what he / she is curious about, what isn't interesting and what might be scary. Give the child only as much information as he / she wants to know about cremation and funerals. If you are honest and open, the child will openly ask any questions that trigger their curiosity. Now you can decide how to answer your child's questions because you have a better understanding regarding cremation. Whatever information you decide to share, take caution and use words that will be understood. This depends not only on the child's age, but also the child's developmental level, personality and vocabulary. If your words and your tone convey you are comfortable with the process of cremation, your child will likely feel the same way. Try not to withhold much information about cremation. Some say cremation is too harsh to explain to children, yet children can cope with what they know. They cannot cope with what they don't know or have never been told. Often their imaginations can conjure up explanations much scarier than reality. Be careful about using euphemisms or even fibbing to children in an attempt to protect them from the truth. Cremation doesn't hurt. The person is no longer alive. The decedent will not feel cremation taking place. Your body is just a cavity and the soul has moved on.